This is the first post I wrote on the topic of Polyhedral Pantheons, but the Polyhedral Pantheons Hall of Fame page is a better starting point. It has links to pretty much everything on my site regarding Polyhedral Pantheons, and even some on other sites. I am shamelessly stealing the idea for this from The Rose of the Prophet trilogy by Margaret Weis and Tracy Hickman. The pantheon is designed somewhat using an icosahedron (a d20). There are twenty gods, each defined by three attributes or primary influences (which color the personality and goals of the god). Good, Evil, Love, War, and so on. This seems almost made for a pantheon design system using clerical domains, doesn’t it? I actually see two ways to make this work. One produces twenty gods, the other produces twelve gods. I’ll do the system that models the books first. 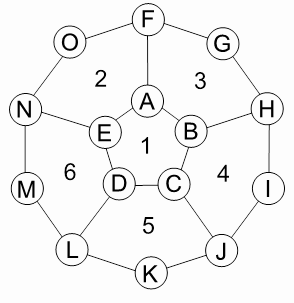 Assign a domain to each of the twelve nodes of the icosahedron, without putting opposing domains on adjacent nodes (this really applies only to alignment domains; I can easily see a god of life (healing) and death, or fire and water). Each god has three domains, no two gods have exactly the same domains, and there are some built-in themes to the sets of gods. You have five gods for each domain, so you could have something like the Rose of the Prophet pantheon with a clear distinction between ‘good’, ‘evil’, and ‘neutral’ gods, or you could have ‘gods of nature’ (with the plant and/or animal domains) and ‘gods of man’ (with human concerns such as war and/or travel). This addresses the major gods of the pantheon; assigning them to demi-, lesser, intermediate, or greater status is not covered here, and there may be other less-important gods in the pantheon. The ‘less-important’ gods may in fact be more powerful or have more domains — if the god of death has little importance to the culture in question it might not be ‘on the icosahedron’ but could still be a greater god due to the metaphysical importance of the portfolio. This model results in twenty gods with different domains assigned, but with at least some similar to their neighbors (built-in themes). This is all to the good. However, I think that each god may be too similar to its neighbors, and we’ve only used twelve of the twenty-two domains in the RSRD (let alone other sources). Here are a couple way to perturb that. Each god has, in addition to the three ‘node domains’, an assigned domain. Choose a domain for each god based on the three already assigned that suits how the god is shaping up. This can be unique to the god (each god has a domain that no other god has), multiply-assigned (each god has a domain that is not a node domain, and more than one god can have the same one), or a node design (overruling placement on the icosahedron; I prefer to not do this because it results in more than five gods with the same domain). Assign a domain to each edge of the icosahedron. There are thirty edges, so you’ll either need more domains (there’s a total of forty-two to assign) or start doubling up (which I don’t much like). Each god ends up with six domains, and shares three of them with each neighbor. There are twelve domains that have five gods, and thirty domains that have two gods (assuming no doubling up). Personally I think this is getting too big, but it may be worth considering. Instead of assigning domains to the nodes of an icosahedron, assign domains to the nodes of a dodecahedron and produce twelve gods, each with five domains (each of which is shared with two other gods). This gives you bigger gods, but perhaps more manageable. It also uses twenty of the twenty-two domains from the RSRD. I’d probably use this to identify the major gods of a world, rather than just a single pantheon (gods for a single culture). Twelve greater gods, for the entire populace of a world, is likely reasonable. If each god also has a personal domain (one not from the adjacent face; see Variation: Assigned Domains above), that gives each greater god six domains. Intermediate gods might have a subset of the patron greater god (five domains, chosen from the domains of the greater god), lesser gods might have four domains, demigods three domains. I think it might be more interesting, though, to leave each of the greater gods with the five initial domains (intermediate with four domains chosen from the patron’s domains, lesser with three domains, demigods with two). However, give each god an assigned domain. This gives you the same number of domains as above, but a particular god likely has a domain that his patron god does not. This suggests a level of politics, with gods changing patrons. The greater gods stay where they are, but the non-greater gods might be able to move around as long as they share a number of domains with the new patron. Rank might even change as the moving god’s domains come into alignment with the patron. A ‘demigod’ might be just a god that only matches two of his patron’s domains — regardless of how many domains he has. If he switches allegiance to a greater god that he matches three domains, that could advance him to lesser god. Conversely, if he then switches allegiance to a god he matches only two domains, he falls back to demigod. Pingback: Polyhedral Pantheons Revisited | Keith Davies — In My Campaign - Keith's thoughts on RPG design and play.